Cartesian equation: (of revolution if and only if a = b). The elliptic cylinders are the cylinders with an ellipse as directrix. 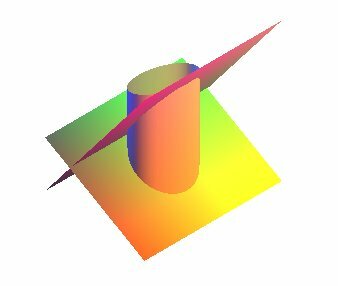 Contrary to appearances, every elliptic cylinder contains circles, intersections between the cylinder and the planes forming an angle with the horizontal. It can therefore be constructed by hanging strings between two circles, the strings being parallel to the line joining the two centers. 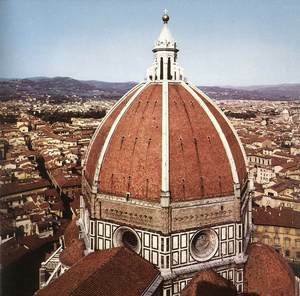 The arches of the cupola of the Duomo in Florence are arcs of circles. The cupola is therefore composed of 8 portions of elliptic cylinders. See this page for more explanations. See also the echo room at Chaise-Dieu, on this page. See also the spherical ellipses , and the focal cubics.